I almost goofed badly when selling a lens. 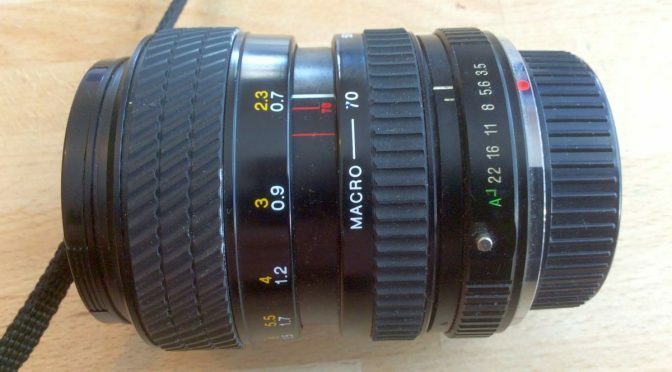 I’d picked up a Ricoh KR-5 Super with a few lens for relative peanuts but decided to sell on a Tokina 25-70mm lens as I already had a Pentax SMC KA zoom of similar length. It was only at the last minute I twigged the lens had the infamous Ricoh Pin issue. If you shoot with Pentax K mount cameras then it’s one you’ll want to know about. In truth it is only an issue with some lenses (many Ricoh lenses don’t have the problem) and only if you intend to mount them on a AF (film or Digital) K Mount camera body. It comes about from a curious historical quirk that now gives rise to unintended problems. The Pentax K-mount not only represents one of the most successful backwardly compatible lens mount series that continues to this day but along with the older M42 screw was one of the most widely adopted mount systems meaning a host of camera & lens manufacturers including Ricoh made lens and SLR bodies (ironically Ricoh are now the owners of the Pentax brand). The Ricoh XR Rikenon 55mm 1:2.2 lens on the left is a standard K-Mount and will present no issues. 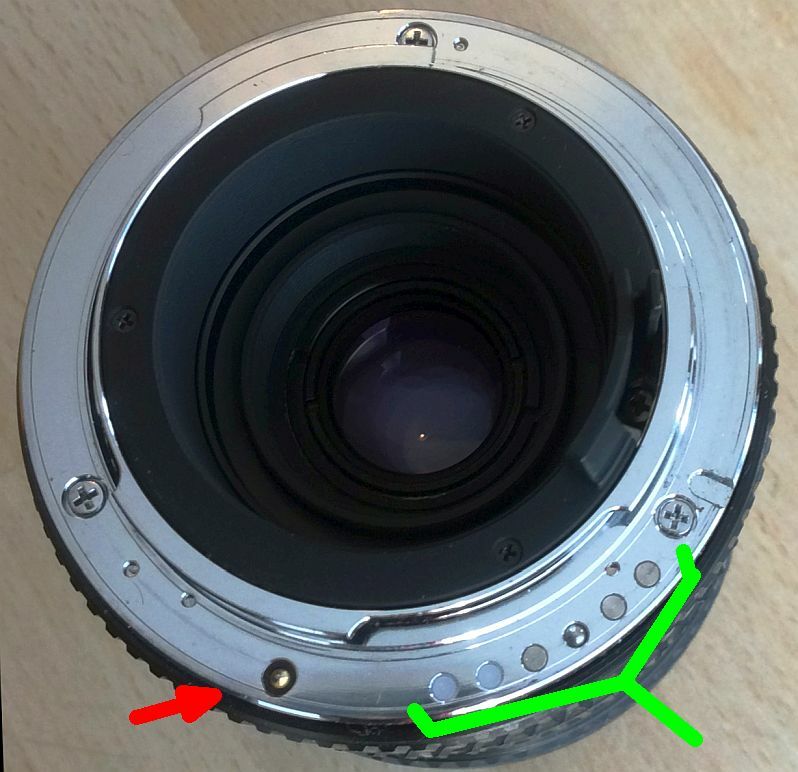 The lens on the Right is a later Rikenon P 50mm 1:2 with the infamous Ricoh pin between 6 & 7 O’Clock (red arrow). AF Pentax users beware !! Our problem arises in the 1980’s. Pentax introduced the KA revision to the K mount. This added up to 6 electrical contacts to allow KA ready cameras the opportunity to control the aperture in Shutter priority or program mode (a feature carried on in later AF revisions). But for some reason Ricoh decided to have their own K mount variant the K-R. This was a simpler one pin and sits at a different location (between 6-7 O’Clock) to the KA contacts (5 O’Clock). At the time there was no huge issue. You could still use a Pentax KA lens on a Ricoh body and K-R lens on a Pentax (you just couldn’t use in shutter priority or program modes on either). Some third party lenses like the Tokina have both which would allow us on both KA & K-R ready bodies. K Mount on a Tokina Lens that features both the KA pin set (green) and the Ricoh Pin (red). Yoiks !!! Our problem comes about when K mount for AF arrived . The point for the screwdrive AF system was exactly where the extra K-R pin was. This lead to the pin on some KR lenses locking into the body on some AF cameras making the lens seem almost impossible to remove Doh !!! Personally I’d check any K mount lens with a A or P on aperture ring and as you can see many 3rd party lenses had both !! The designations KR (aka K/R or K-R), P-MC, PK-R, “P/K-AR” or “P/K-A R-P/K” or something similar are another clue. Ricoh’s K-R lenses were Rikenon P (the XR Rikenon are pretty safe but do check if has A or P on aperture ring). 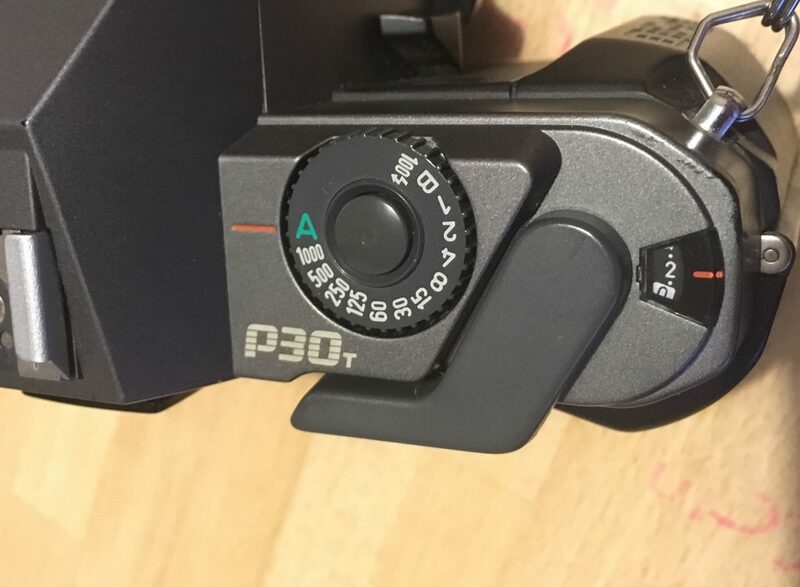 Personally better being paranoid as a host of 3rd party makers incorporated the K-R setting – the only group you don’t need to worry about are Pentax own brand ! !